Emily Ash and Sid Ahuja speak at ASG Senate. Ahuja helped spearhead the expansion of a mandated student group CARE training to club sports teams. Club sports teams will now be required to complete Center for Awareness, Response and Education trainings after Associated Student Government partnered with Northwestern Recreation to extend the mandate beyond ASG funded student groups. CARE trainings, which promote healthy sexuality and fight sexual violence, were mandated for ASG-funded groups in November 2017. 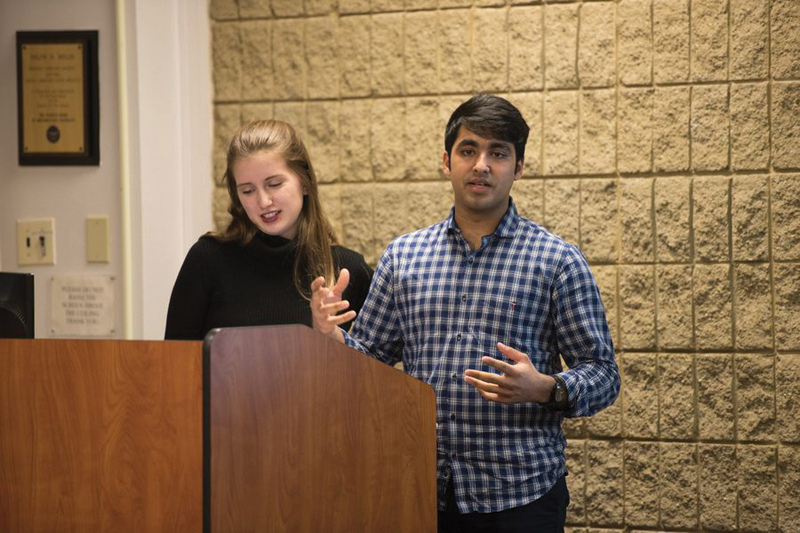 During Fall Quarter this year, Sid Ahuja, the ASG vice president for student activities and resources, and Rebecca Lazer, the ASG vice president for health and wellness, spearheaded the initiative to include club sports teams in the training mandate. Ahuja and Lazer chose club sports because they thought it would make a big impact — about 1,400 NU students are on club sports teams, which would increase the trainings’ reach considerably, Ahuja said. The mandate requires that two members of each team’s executive board complete the training. If the trainings aren’t finished, NU Recreation can deny the teams’ use of facilities. Ahuja and Lazer reached out to NU Recreation in late November, said Jake Rowland, NU Recreation’s competitive sports and Wildcat Camp coordinator. Rowland liked the idea, and gave verbal confirmation in Fall Quarter. However, Ahuja and Lazer didn’t receive a written statement from NU Recreation until Jan. 16. The written statement from Rowland is important to ensure that the mandate will outlive the careers of the current administrators, ASG President Emily Ash said. Rowland said the training dates aren’t yet available, but Ahuja said they will be mandated starting in Spring Quarter.